M-Net City (channel 115) will air Eye In The Sky on February 8, 2019, at 20h50. Director Gavin Hood leads Helen Mirren and Aaron Paul in this war drama. A military team is put in a moral dilemma when a girl enters the kill zone of an anti-terror exercise. 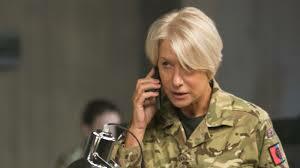 A lieutenant general (Alan Rickman) and a colonel (Helen Mirren) face political opposition after ordering a drone missile strike to take out a group of suicide bombers in Nairobi, Kenya. The film, which also features Alan Rickman, and Barkhad Abdi, is based on a screenplay by Guy Hibbert and explores the ethical challenges of drone warfare. Filming began in South Africa in September 2014.